Microwave green beans as directed on bag using minimum time. Meanwhile, in 12-inch skillet, heat oil over medium-high heat. Add bell pepper; sauté 3 to 5 minutes or until they begin to brown and are crisp-tender. Remove from heat. Add green beans to skillet; toss until coated with oil. Remove green beans and bell peppers from skillet to plate; set aside. To same skillet, add garlic, gingerroot, soy sauce, harissa sauce, salt and black pepper; stir. Cook about 1 minute or until hot. Return green beans and bell peppers to skillet; mix thoroughly. Sprinkle peanuts over top. Serve immediately. Serve with your protein of choice. More color? you can add or substitute orange pepper. 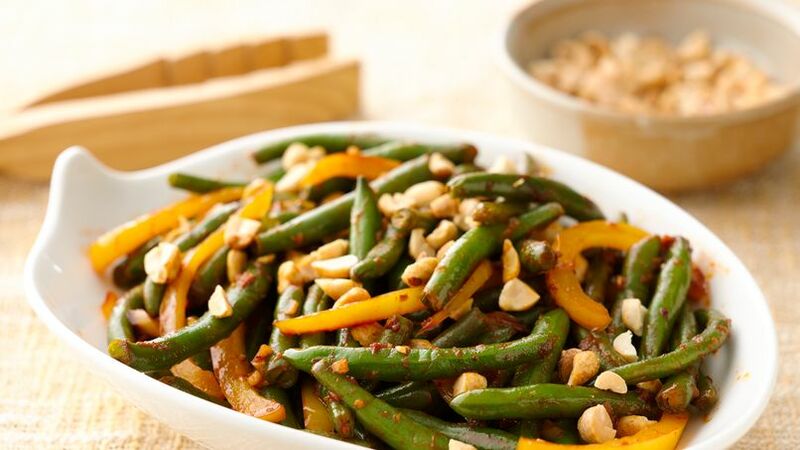 Green beans with harrisa, garlic and ginger will be a hit for your family.